The Camden branch is the smallest of the 3 Rutgers campuses with about 5000 undergraduates, only 600 of whom live in the 3 dorms buildings. There are no traditional-style dorms; freshmen live in 3-bedroom/6-person suites; upperclassmen get their own bedrooms in suites or apartments. All rooms have a fridge and microwave, AC, and cable. Campus was surprisingly nice and compact; I expected more of an urban feel – and this is definitely in the city, but once on campus, it feels quiet and safe. 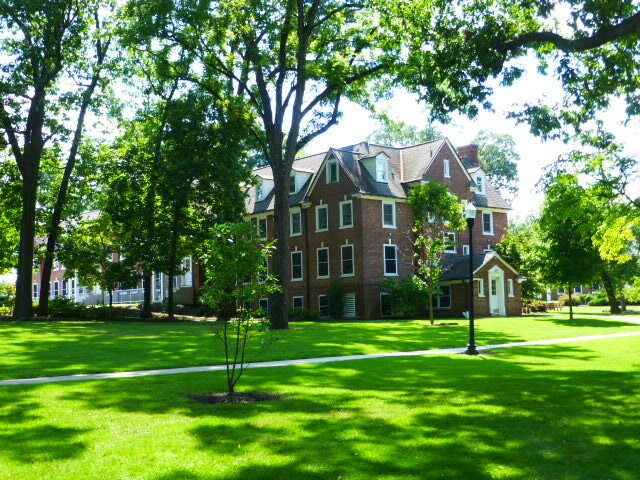 An academic building in the foreground with an upperclassmen dorm (apartment style living) in the back. Weekends are “… quiet,” said one of the students working in admissions, the only 1 of the 3 I spoke with who lives on campus. There are some activities on campus, but not a lot. There are shuttles around town every 2nd Saturday to the malls, stores, theaters, etc. There’s also a subway stop about a 5-minute walk from campus; for $3 round-trip, students can get into Philly which can be seen from campus. There’s also a bus station to other cities for students wanting to go to NYC, Baltimore, or DC. A therapy dog visiting campus; students also get free coffee during exams! Every year, the school holds a Civic Engagement Day of Service. 20% of students go Greek, but not all the chapters are nationally recognized. One of the students tried to explain that “it’s different here. It’s more values based. It’s not like the movies.” However, I think that this is the way most chapters are moving (particularly at smaller schools). “There’s no traditional Rush. You get asked to join.” Students are eligible after completing 12 credits. “Food is good but it’s repetitive. As a senior, I’d love for them to put some money into changing things up.” Students get a declining dollar account with freshmen automatically enrolled in the highest level. “They don’t have kitchens in the freshmen dorm. 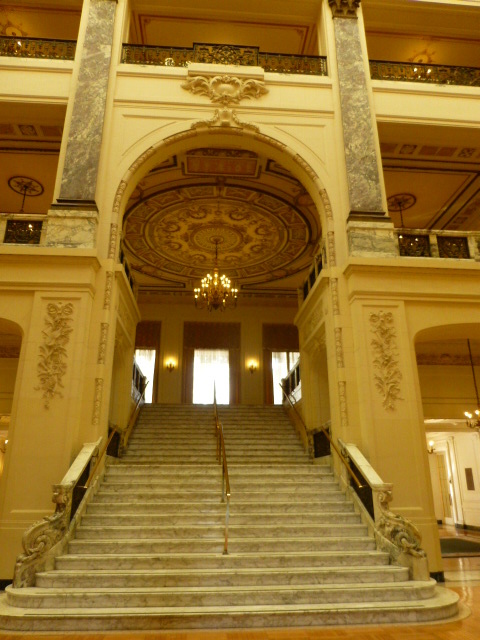 After that, we have kitchens so we can get fewer dollars on our account,” said the tour guide. Students also said that parking is a bit of an issue. “It’s there, but they just moved it farther away. They do run shuttles though.” It seems that the parking issues are the same as in any city. Although there is a priority application deadline, they will continue to admit students if there is available space. During admissions, qualified students will get invited to join the Honors College or the Leadership Institute. NJ residents are eligible to participate in the Bridge the Gap initiative which helps cover tuition for lower-income students. One of the lecture halls with class going on. It’s far from full. 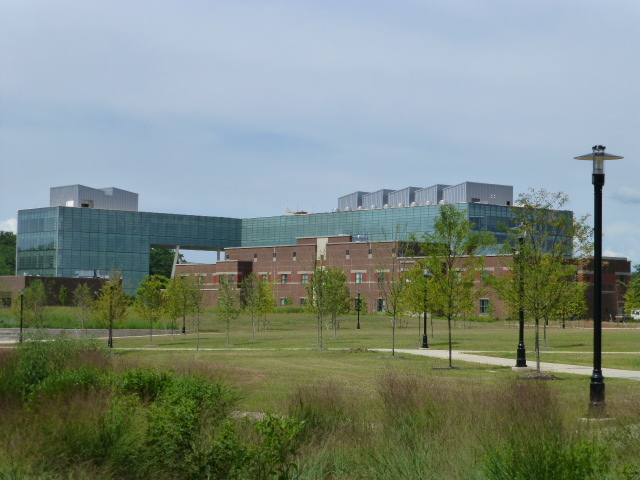 The Camden campus only has 3 undergraduate academic colleges: Arts & Sciences, Business, and Nursing. The business offerings are limited, but they have some interesting options in A&S such as Computational and Integrative Biology, Urban Studies and Community Development, and Childhood Studies. The minors offer even more choices including Museum Studies, Animation, Statistics, Ethics, and Justice and Society. Money is being put into new facilities including a new nursing building that is going up. The Fine Arts building has a Green Screen, digital media equipment, a black box theater, and more. The athletic center with a view of the bridge to Philadelphia in the background. Because of its size, students get much better access to the professors, something that all 3 students I spoke to raved about. There are a couple lecture halls on campus holding up to 250 students, but most classes are a much more manageable size of 20-30. Even when we toured, we saw a class in the lecture hall with very few students (like 10) in it. The tour guide’s largest class was his General Bio class which did fill a lecture hall; on the other end, he’s had a class with 4 students. Classrooms are now equipped with cameras to record lectures. Some professors do this automatically and will post the classes; others will do it if asked by a student who has to miss class. NJIT is a physically small campus (2×2 city blocks) located right in Newark. It has managed to combine the best of a central campus feel with the urban environment. The central Plaza is separated into Upper Green (there’s currently construction going on) and Lower Green (filled with bouncy houses and other activities when I visited during mid-afternoon). Because of its location (and because of the in-state tuition), it remains very much a commuter school with only about 25% of students living on campus. Commuters are well taken care of here with regular events for commuters to help them connect to others and the school. My tour guide was a commuter and loved it; he never felt like he wasn’t part of the school, and did spend a great deal of time on campus. If he could change anything about the school, he would add sleeping pods in the library. “Students who live in dorms can nap during the day. Commuters are sometimes here 10-14 hours a day, and it would be nice to be able to nap in our down-time!” The big parking garage provides plenty of space for drivers; an app shows how many open spots there are so they don’t waste time driving through the garage looking. Commuters pay less than resident students. There are 2 freshmen halls (1 traditional, 1 suite) and 2 upperclassmen dorms with apartments and suites. There is a Greek Village with small residential units for students. The dining hall is big with some unusual options including sushi, make-your-own-pizza, carving stations, and even fajitas. Next door, there’s a commuter dining hall with microwaves, seating, and even a grill to purchase food. There are several grab-and-go places on and near around campus, and there are 3 food trucks regularly parked on campus. “I ate at one of those all year last year! The food is so good.” Upstairs from the dining hall is a pub. Everyone is welcome, but must show both a license and a current NJIT ID to get into the 21+ side. The Honors College offers spots to students in all majors; to qualify, applicants must have a 1370 SAT/30 ACT and be in the top 10% of their classes (or a B+ average if schools don’t rank). Students are guaranteed housing, and they’ve just built a new honors dorm although living there is not required. Students in the college receive a scholarship that can be stacked with any other merit aid they receive. Students must complete 30 hours of community service, at least half of those off campus. “I like it here because most of the classes aren’t huge,” said my tour guide. The largest lectures he’s ever been in had 60-80 students, the size of the largest halls on campus. His smallest classes had 30. Class selection is good, and it’s extended because they also have the option to cross-register at Rutgers Newark. Their Architecture program is extensive; the Bachelor of Architecture is a 5-year program; along with Princeton, these are the only 2 in the state that lets students get certified directly. However, they also offer several BS/MS or MIP programs combining Architecture with Infrastructure Planning, Management, Civil Engineering, and Technology. They also offer graduate work in Pharmaceutical and Biopharmaceutical Engineering; undergrads interested in this major in Chemical Engineering and then can move into the grad program. They have a large telescope on top of one of the buildings, “but we’re in Newark. It’s not entirely useful.” They do have an arrangement with NASA, though, and the school’s solar telescope is being used extensively. Their Center for Injury Biomechanics, Materials, and Medicine (CIBM3) is doing great work with concussions and Traumatic Brain Injuries. CoAD is a design showcase where students can get feedback from industry leaders on projects they’re working on. Students are pretty active in campus activities in addition to taking advantage of Newark and New York City. Greek Life makes up less than 10% of the population, but they organize a lot of events. They are DI for basketball, lacrosse, and soccer. They have a Fencing club and a fencing room in the rec center. The mascot is the Highlander. They run a joint theater program with Rutgers Newark. “We’re the #1 school for most squirrels and in the top 10 for most haunted campus. Interesting but irrelevant,” said the tour guide. The main quad area. Graduates walk along this path as they march into graduation. This feels like a small, bucolic college, and I can see why this got the “University in the Forest” nickname (there’s also an Arboretum next door). I visited in March before the leaves were in; I can only imagine what it looks like in the summer (although a colleague said that it’s SO wooded that it can almost get dreary). Despite the rural/forested appearance, things are highly accessible directly off campus: the cute downtown area of Madison is a 5-minute walk. Morristown can be reached by train “but can be expensive; you wouldn’t do it every day,” said the tour guide. Students don’t feel like they need to leave campus for things to do but like having the options off campus. Students were out in groups around campus giving it a vibrant feel. For students interested in the arts, there is a large, relatively new arts building with wings for different disciplines (fine arts, theater, music). There’s even a “sculpture garden” courtyard showcasing student work. It’s easy to get involved in any of the disciplines even for non-majors. There’s also a separate building that houses the Shakespeare Theater of NJ which puts on 4 shows a year. They offer an arts scholarship requiring a separate application (the deadline was 4/3 in 2017) which is stackable on merit scholarships. There are 50 school-certified study abroad programs. Most are semester-long, but there are also 2-, 3-, and 4-week “short treks” (domestic and international) led by professors. The sculpture courtyard in the Arts Building. Internships, several of which are funded through outside sources. Semester programs on Wall Street (primarily for juniors), at the UN, in Communications and Media, in Contemporary Art at MOMA, in social entrepreneurship and community service, and NY Rep Theater. These are equivalent to 4 4-credit classes: students spend 3 days on campus with profs and their cohorts and 2 days in the city. PoliSci students can complete a Washington Semester through GWU. Drew was founded as a Methodist Seminary but is no longer affiliated, although the largest Methodist Archive in the country is located here. They’re nationally recognized for civic engagement, and they run a Civic Engagement Program. This requires a separate application (the deadline was 4/3 in 2017) and is stackable on merit scholarships. They look to bring in 35-40 students each year who have done a great deal of service; this comes with a scholarship. Freshmen are housed together in an LLC and take a Freshman Seminar course. The expectation is that they’ll continue to do good work, and they need to complete 100 hours of service each year, at least half of which has to be done during the school year. The program is intentional and builds developmentally over 4 years; by senior year, students complete a capstone is related to the cumulative experience; they present this at a showcase in the spring. Some of the upperclassmen dorms. There are several Cooperative Degree programs with no additional admission requirements except for the MD program. Advising for the others starts freshmen year. 7-year accelerated med school with Rutgers. 2 BA-JD: 3+3 Seton Hall or NY Law. 3+2 with Duke envi sci/management or forestry. 4+1 BA/MS software engineering with Stevens. 3+2 Engineering with Columbia. Students interested in Biomedical can do this here. BA/MA with Wake Forest in Business Management. One of the freshmen dorms; the late night store is in this building. Housing is guaranteed but not required. Dorms are fairly standard for freshman with some optional triples. Several lounges have fireplaces. The first floor of one dorm in the main circle houses a late-night store open until 2:00 am. Dining hall food gets much better reviews now: the physical space got refurbished a couple years ago and they got a new vendor when the new president came in. “Food went from a 2 to an 8,” said the tour guide. About 50% of the 1500 undergrads come from NJ. They’re looking to grow to about 1800 over the next few years. This year, about 20% came in through ED/EDII, and they’ll start offering EA next year. They do offer an Honors Program which comes with a $25,000 yearly scholarship. This is a small, Catholic school that had been single-gender until last year when it became “fully coeducational” in 2016. The male population quickly jumped to about 40% within the year. It’s a safe campus in a residential area, and while there are no longer shuttles around town provided by the school, the train station is right outside the school gates. NYC is an hour away. Only about 2/3 of students live on campus and they pull a lot of students from the local area. This is still heavily Catholic with Sisters living on and around campus. There is a Mass during orientation, and they’re offered daily but not required. I’m not sure about this school. It’s definitely small (both in size and population – they enroll under 1000 students) and manageable. Students were out even on a chilly morning around 9:30. There weren’t a ton around, but that’s normal for that time of day. However, graduation rate hovers around 50% in 6-years. I get this impression that students want a larger campus, and some students who came here for the single-gender experience left when it went coed. I’m not sure it offers anything unique to draw students from a distance; there are other small Catholic schools around. I just didn’t have a sense of what distinguished this one, unfortunately. The campus greenhouse; don’t see too many free-standing ones on campuses! I talked to a senior majoring in Sociology, “I still have no idea what I’m doing after graduation.” She loved that it was a small school. “It’s easy to get around and I know everyone at least by face if not by name.” She was surprised at how welcoming everyone was. “You’re not an outsider here.” She told me about how during orientation, she ended up having to go to an event before her mother left and was unable to say goodbye. She was in tears, but people she didn’t even know came over and hugged her. The academic offerings are limited, but students are allowed to take classes at Drew and at the nearby Fairleigh Dickenson campus. “There’s a path that leads right onto their athletic fields. It’s easy to get over there.” Drew is about 10 minutes away. She had a friend take music classes there; she didn’t have a car, but the school got her transportation over. Like many Catholic schools, students here agreed that SHU is “as Catholic as you make it.” This is a Diocesan university, unaffiliated with a specific branch of Catholicism. Just over 2/3 of the 5,800 undergraduates self-identify as Catholic, “but that doesn’t mean we’re practicing.” All faiths are welcomed. 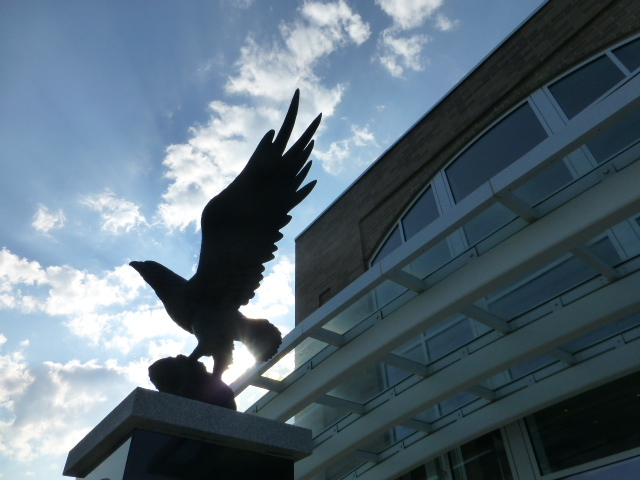 The mission is to create a “University of Opportunity for Deserving Students” while teaching respect and understanding based on the vision of “Home for the Mind, Heart, and Spirit.” SHU has a 44% diversity rate; students who come from all over the US and 70 foreign countries. Students are engaged with each other and lots were wearing Seton Hall gear. There were so many students around that I was surprised to learn that students were actually on break. 80% of freshmen and 50% of total undergrads live on campus. Housing is not guaranteed, but they’ve never had a student denied if they’ve applied by the deadline. RAs and priests live in each of the 6 residence halls; they also provide 2 apartment buildings for upperclassmen. The dining hall, an all-you-can-eat option, is spacious and has lots of stations and food choices. Booths have power outlets which is smart. “When they serve chicken tenders or mac & cheese, the line is out the door. Otherwise, maybe it’s a 3 minute wait for food,” said one of the students. I ate lunch there and was pleased with the food. Students feel that there’s enough to do on campus. As a founding member of the Big East, their 14 DI sports teams are a big draw, particularly basketball. Tickets cost $100 for the season (refunded if they go to all the games). Another student raved about the fact that Seton Hall won “Best College Christmas Tradition”: on the first Monday of December, they light the large outdoor tree, sing carols, and have hot chocolate. One student told me that campus can be quiet on the weekends. However, there’s no shortage of things to do. Many students choose Seton Hall because of its proximity to NYC. The train station is a 10-minute walk (or quick shuttle ride) from campus; from there, it’s a 30-minute ride into Penn Station. Luckily, the train station is on the “good side” of campus. I was worried as I drove in: an area close to campus was run-down with boarded-up/gated storefronts, garbage, and people literally wandering in the streets. Suddenly, within a block or two of campus, things changed. “One side of campus is shady; the other is a mega-rich neighborhood,” said students. Campus is beautiful, safe, and gated; students swipe in, and visitors check in with a guard. Shuttles run every 30 minutes. Only seniors, commuters, and students with jobs or internships can have cars on campus. Commuters are given lots of resources and chances to integrate into the community; the university also recognizes the different needs of commuting students. For example, the Commuter Café is open 10-7 when classes are in session. Academics are student-centered, and students like the atmosphere: “We’re pretty chill here. It’s cooperative,” said the tour guide. Freshmen are assigned both an academic and a peer advisor, and they’re enrolled in a 1-credit University Life class to help transition into college. Students get a laptop when they start and a new one 2 years later (they can keep that one after graduation). They rank in the top 5 universities (keeping company with places like UPenn and Duke) for internships: over 80% of students complete at least 1. Clearly they’re doing something right: they’ve had 18 Fulbright awards since 2009. The size of the school “offers all the advantages of a large research university but the support of a small school,” said the admissions rep. Classes average 21 students with Freshman English averaging 15 and languages capped at 15. The tour guide’s larges class was 30 (Intro to Bio) and smallest was 15 (Freshman Eng). Another student’s smallest class was 7 (Russian). Students take 5 religious classes: the first one, and the only common one, is Journey of Transformation. “It’s mostly philosophy and introspective.” Students then choose 4 others. Students in the Honors Program (requiring a separate application to get in) take a different class in place of Freshman English and the Transformations class. There are two early deadlines to be aware of for scholarships. First, students interested in Special Scholarships need to apply by 1/5. Second, to be eligible for the Public Tuition Rate, they must apply by 12/15. For this, students must rank in the top 10% of their high school class and meet various GPA and score requirements. They do not need to be NJ residents to get this award. If the high school doesn’t rank, the school counselor should contact admissions with information. 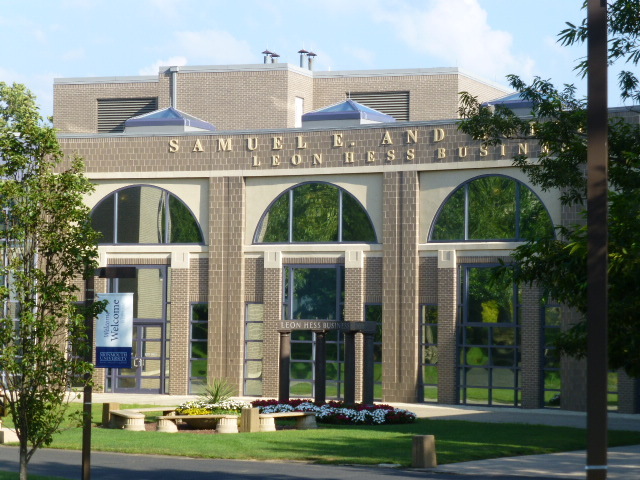 Health and Medical Sciences: All the programs in this school are streamlined undergrad majors combined with graduate degrees (Masters except for the DPT). 100% do internships or study abroad with UN, USAID, UNESCO, UNICEF, FBI, Embassies, Red Cross, Missions abroad, etc. Management Information Systems, Legal Studies, and Finance and Mathematical Finance are worth nothing. This is a Direct-Admit program. Students complete more practicum placements and hours (and in a variety of schools) than at other schools. A Joint Masters in speech language pathology is available. The Medical School will open in the fall of 2018; they’ll partner with Hackensack University Medical Center, listed as the #1 hospital in NJ. They’ll have a direct admit, 7-year BS/MD degree program. I had wanted to see TCNJ since a colleague’s son had gone there and thrived. I had heard great stories: not only was he incredibly happy to be there (so happy that he stayed on campus for 2 summers), but he got involved in a lot of research and before he graduated, ended up being published in a textbook that one of his professors wrote. Two students told me essentially the same thing about what surprised them: it’s small enough for the class sizes they have but large enough to meet people. “I meet new people all the time, but I see people I know all the time.” Another student was surprised at how challenging the academics were and how smart everyone is. Classes tend to be on the small size: of the students I spoke to, the smallest classes ranged from 11-16; the largest ranged from 25-40. TAs don’t teach classes, but they may help run labs or foreign language discussion sections. Housing is guaranteed for two years (4 years for out-of-state students), “but I haven’t heard of anyone having trouble getting it if they want it.” They traditionally had been able to house a bit more than half of the 6,500 undergraduates, but now they have space for 460 juniors and seniors in the new Campus Village apartments. The spots filled up within an hour, so TCNJ is building more to meet the demand. This area is designed with retail space on street-level to increase the amount of places students can walk to. Freshmen can’t have cars. 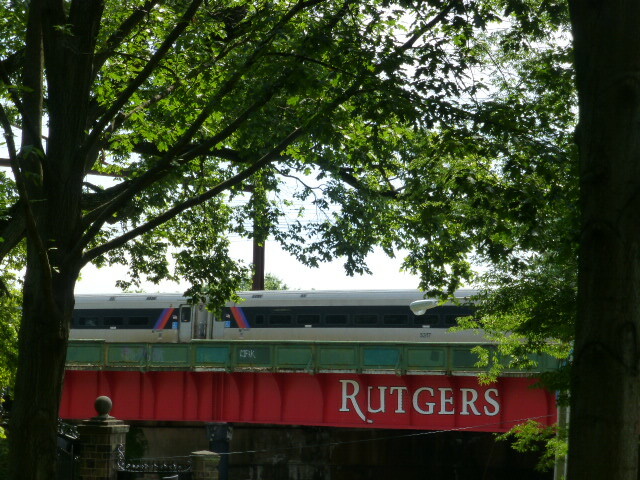 The Loop takes kids around campus and town, including the mall, the movies, and even into Princeton. They can also take the town bus, that that’s not free. Upperclassmen can have cars; there’s “always parking in the garage.” Campus is both walkable and safe. The blue lights were pressed “12 times by accident last year,” said a rep; when I asked a junior if he had ever heard of them being used, he couldn’t think of a single time. There really is something for everyone here. There are plenty of activities (including Bubble Soccer and Billiard Soccer tournaments) and traditions the kids like. The EPCOT Festival is a particularly popular as is jumping in the fountain before graduation. The Radio Station is well-run and DJing is popular; it is 1 of 4 radio stations nationally to get nominated for Station of the Year by College Music Journal. Approximately 1/3 of students will go Greek which has a delayed rush in the spring. Sports (DIII) are incredibly successful and well supported by fans. Students interested in service can apply to become a Bonner scholar. Students couldn’t say enough about their classes and professors. 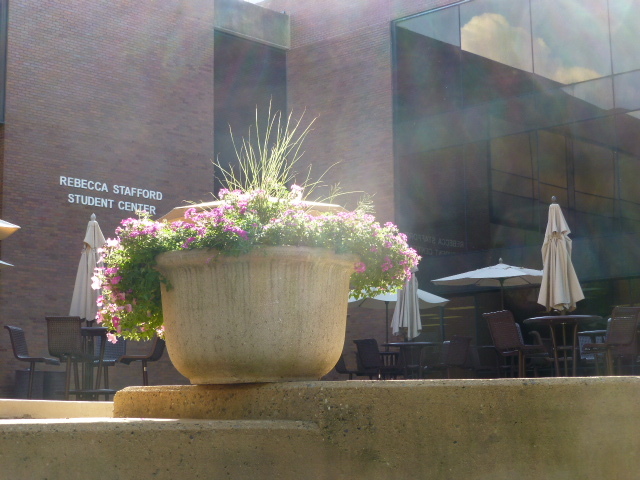 The Arts and Interactive Media building is relatively new, and they receive a 2010 Art grant resulting in 4 large colored balls as a permanent art installation on a quad that are supposed to be pixels. Departments are well-stocked with top-notch technology for teaching such as the simulation labs in the Nursing department and the planetarium for astronomy students. The Education department offers all the usual subjects plus Deaf/HH and Urban Education. The Biomedical Engineering degree gives students an option of doing a 7-year Medical School program. The iSTEM (integrative STEM) is noteworthy. TCNJ is one of several colleges that offers Study-Travel classes during their Maymester. Some students take a class in the spring that has a travel component; other classes are “Stand-alone” classes in students travel for 2-3 weeks. Some travel sites/topics include studying/comparing Genocide in Armenia and Eastern Europe; the Gendered History of Food in Italy; and Biology in the Galapagos and the Rain Forest. During my tour, I had a hard time figuring out what makes Rider different from other smallish liberal arts schools. It’s a lovely campus with just over 4000 undergrads on the main campus in Lawrenceville. I visited on a partly-sunny day in November; although it was a bit windy, it wasn’t all that chilly, but only a few people seemed to be around campus. I don’t know how much of that was because it was a Saturday afternoon and classes were not in session, because students maybe go home on the weekend, or because there was an open house and several students were giving tours and helping to staff some Student Life Booths (although those students only represented a tiny fraction of the total population). The students I talked to were earnest and pleasant enough but most had trouble answering questions with any substance. Everyone I talked to said that they liked the community feel on campus, but there was little talk of how that manifested itself. I had to go to the website to learn about student life on campus; there appear to be a lot of great-sounding traditions, but none of the students talked about them, even when asked. The two students who were staffing the Hillel booth at the Open House Activities Fair were the exception to this. They were enthusiastic, knowledgeable, and interesting to talk to. They said they were “small but mighty” – there is a decent Jewish population on campus, but not a huge regular group at Hillel. However, those who came were very active, and they would often do things with The College of New Jersey which is only a few miles down the road. This seems like a good university for students looking for a solid, basic liberal-arts education with some options for career-oriented majors. I caught a bit of the Business Department’s presentation to prospective students. They were up-front about the fact that many careers that students prepare for don’t even exist yet. They have a wide range of options to choose from within the business program including Management and Leadership, Global Supply Chain Management, Information Systems, Business Economics, and Sport Management. Organizational Psychology will begin in Fall 2016. 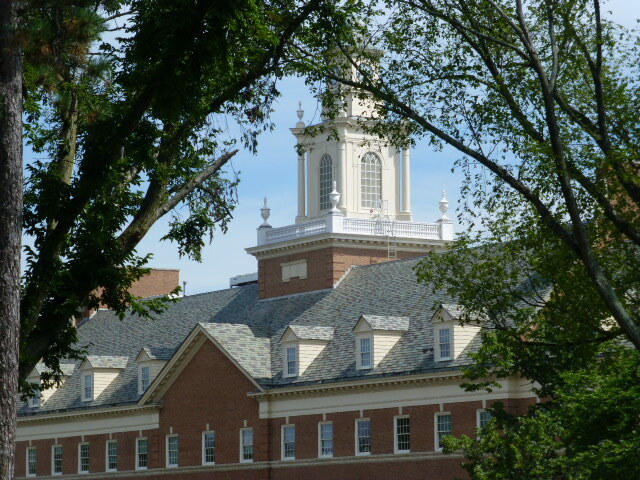 Rider merged with the Westminster Choir College in the 1990s; that campus now houses the Arts College. They have robust range of offerings in this division including a BA in Popular Music Culture, Musical Theater, and Arts Administration. Classes are kept small: the tour guide’s largest class had 40 students in her Intro to Geology class and 16 in her Cognitive Psych lab. Her favorite class was Theories of Psychotherapy. Centennial Pond is a nice feature on campus; there’s a bridge across and 2 fountains. The Lake House is a dorm on the far side for Musical Theater Majors. There are 2 frats (also housed by the lake) and 4 sororities. The Chapel has all sorts of religious services, including Shabbat services. 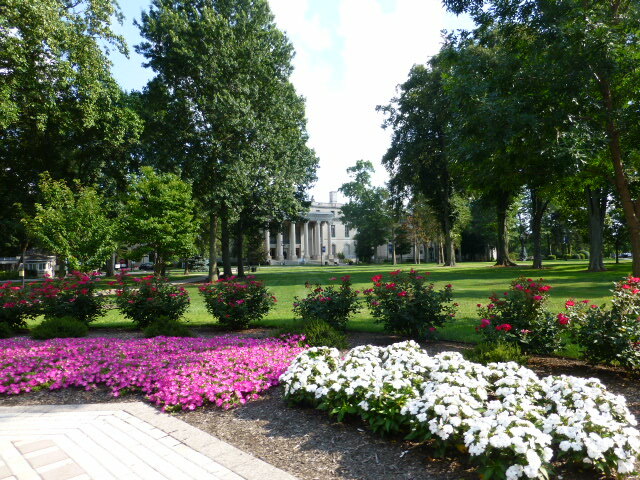 Monmouth is a private university with about 4400 undergraduates. The main hall on campus is Wilson Hall built in the early 1900s and named for President Wilson who had stayed there during his 1916 campaign for president. 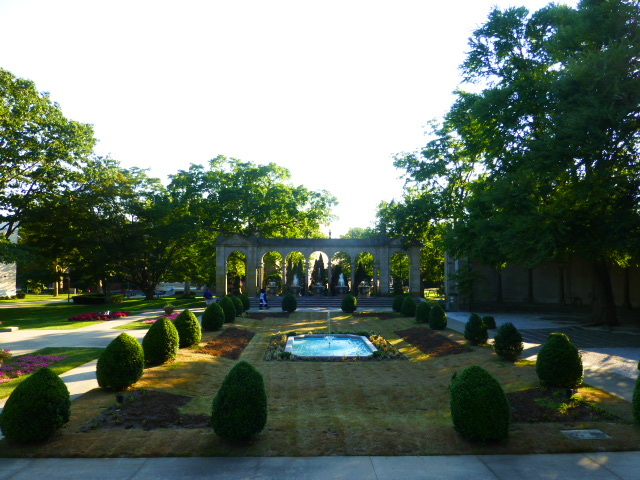 Now on the National Register of Historic Places, it is surrounded by the Shadow Lawn Estate, modeled after the Gardens of Versailles. Many people will recognized it as Dr. Warbuck’s mansion from Annie. 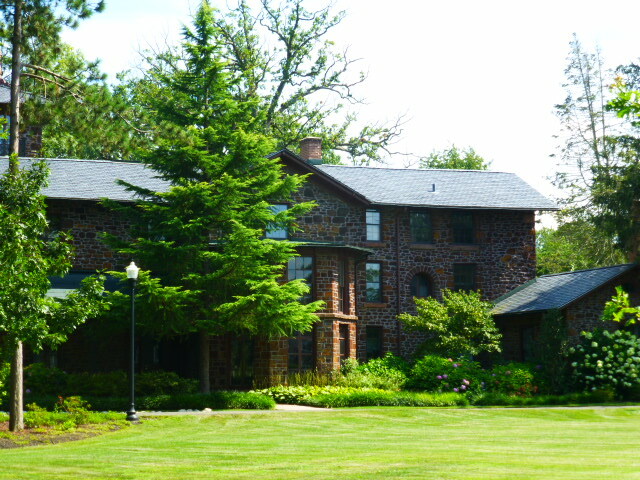 The Guggenheim family “cottage” (mansion) is also on campus and now houses the library and cafe. There are multiple 5-year Bachelor/Masters programs. Their Social Work (concentrations in International and Community Development or Families and Children) and Software Engineering programs are top ranked. They have a student-run record label! Marine Biology is well-regarded with research opportunities in the Bahamas. Their Clinical Lab Science major is unusual. Students can complete concentrations in Cytotechnology or Medical Lab Sciences. Other unusual majors include: Marine and Environmental Biology and Policy, Chemistry: Chemical Physics, Homeland Security, and Fine Arts with concentrations in Creative Writing, Animation, or Graphic Design. They’re starting their nursing program in the fall of 2014 with 25 spots anticipated. Students will need about a 1600 SAT and 3.25 GPA and must write an essay addressing interest. They offer 3 free rides to law school. The art museum has exhibits and studio space. Housing is guaranteed for freshmen, and starting this year, for sophomores as well (a new sophomore residential hall just opened up). A tunnel under the road leads to the residential oval where there’s a 50/50 split between traditional housing and suites, although freshmen tend to be in more standard cinderblock set-ups. Dorms are wired for wifi, but rooms have backup Ethernet hookups. Each room has cable access for students wanting to buy into that system. There is no official Greek housing, but groups can live together on a hall as long as they don’t exceed 15% of space. Most students will opt to live on campus, but there’s plenty of off-campus housing should they choose to move off. Most students living in non-campus housing will need cars or will ride the shuttle into school. Parking costs $300 a year in the assigned lot; it’s first come, first serve. The Multipurpose Activity Center (MAC) was completely built with donations. 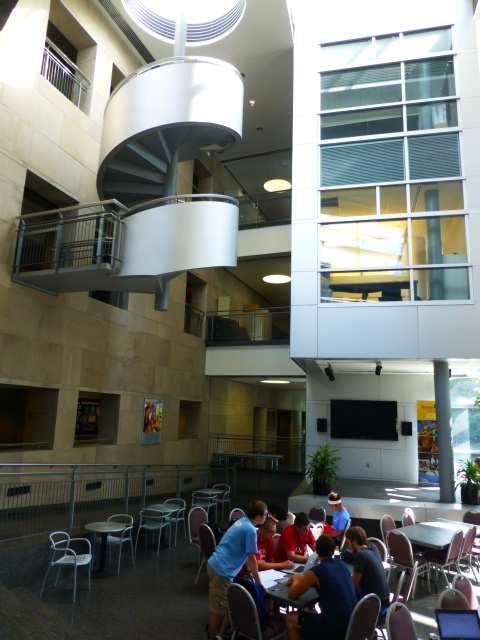 They have TV and radio stations inside, student activity offices, and plenty of meeting spaces. There are even special recycling bins; by using them, students win points for iPods and more. Monmouth has a world-class debate team which won a national competition last year. 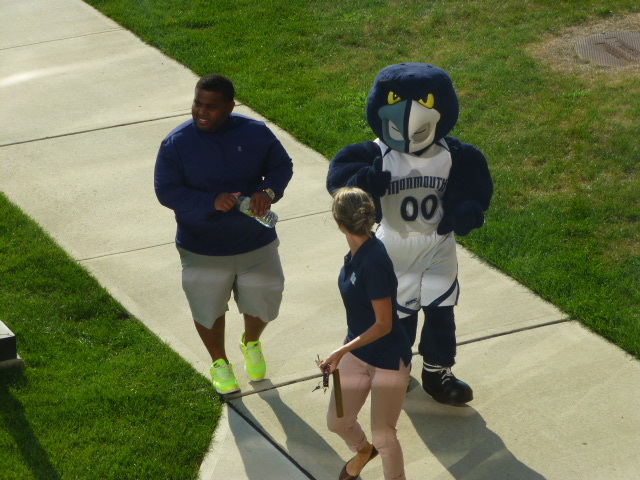 Students are given a calendar of activities when they arrive on campus. “There’s a ton to do on and off campus,” said the tour guide. Big campus traditions include Battle of the Buildings (inter-dorms competition in the fall, Winter Ball (prom-like dance), and Spring Fling. Off-campus trips, include weekend shuttles to the beach, require a $5 reservation to hold a the spot, but they get it back when they get on the bus. Admitted students tend to have a B+ average and have about a 1600 SAT or 24 ACT. Crossover colleges are often Scranton, Charleston, Iona, TCNJ, Rowan, and Drew. About 65 students are admitted to the Honors program during the application process. They are housed together and have access to specially designed classes that are often thematic and emphasize creativity. Students need to keep a 3.5 in the major and 3.4 overall to stay in the program. The Honors Program has about a 94% retention rate. I heard stories from former Rutgers students that scheduling classes with enough time in between was a nightmare and that they needed to ride buses to class because of the size of campus. I’ve seen state universities with enough students to populate small cities but never one that had spread out over such a large expanse, so I was curious – and I wondered how they kept attracting students when it was so difficult to get around. Having seen it now, I get it. Students get around easily on the fleet of 60 buses that run every 5 minutes, and the university has made sure not only that scheduling works, but that students have a variety of options to suit all sorts of needs and interests. Being a Rutgers student means having access to many campuses in one. The New Brunswick campus (Rutger’s flagship) is unusual in that they don’t have a single contiguous campus. Instead, they have five campuses with distinct feels. Each has residence halls, libraries, and recreational facilities, but students can take classes, eat, study, or work out on any campus. 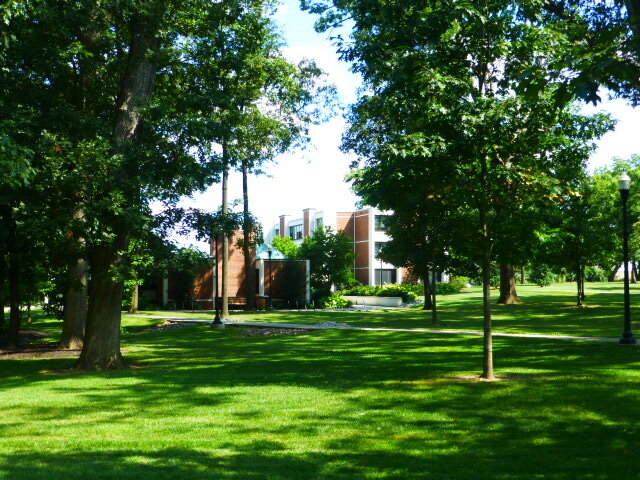 The Busch Campus has the stadium and lots of recreation facilities in addition to the Engineering department, most of the sciences, computer science, half of psychology, and math. 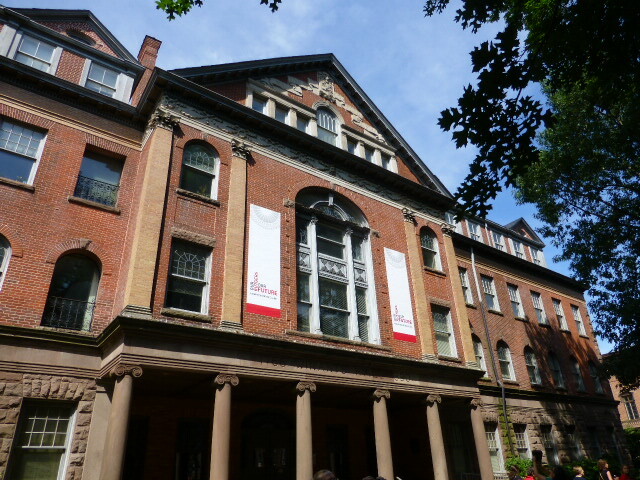 The Douglass Campus was originally the NJ College for Women, and remains a residential college for women. It looks like a traditional college campus with trees and lots of green open space. Special programs for leadership development are housed here. The Cook and Douglass Campuses are contiguous; the Cook campus is the original land-grant portion of campus, and many of the Applied Science fields (biotechnology, food science, meteorology, pre-vet) are still here as well as a farm so students have experience with animals. The business and art departments are also here. 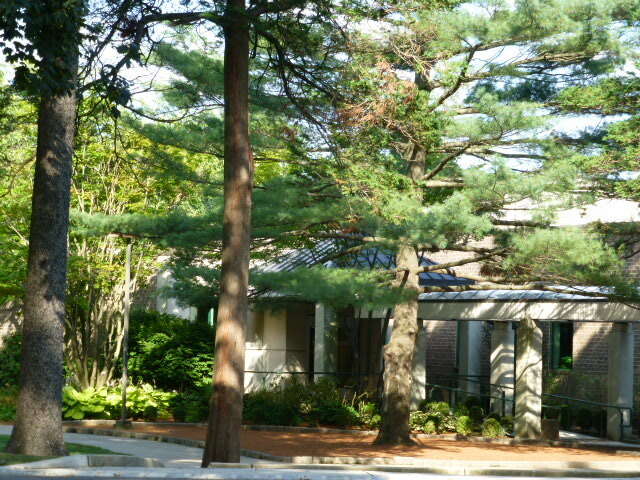 The College Avenue Campus is the smallest campus and houses English, history, languages, economics, and other similar departments. The Livingston Campus is seeing quite a bit of new construction with a collection of apartment buildings; the first floor of the buildings house retail establishments such as a movie theater, a 24-hour diner, Starbucks, a Mexican restaurant, and more. The student housing above this are mostly singles. The original site of the school, Queens Campus, is not considered one of the 5 campuses because there are no classes held there anymore. Instead, there are offices, a museum, and the chapel. There are two satellite campuses: the Newark campus is 15 miles from NYC, and the Camden campus is across the river from Philadelphia. Rutgers was founded in 1766, making it the ninth oldest university in the country (the second public university after William and Mary). They got the land-grant in the mid-1800s and were officially named the State University in the mid-1900s. Currently, there are about 32,000 undergraduates (and about another 10,000 in the graduate and medical schools) at New Brunswick, representing all US states and 125 countries (with 120 languages spoken). However, they’re looking to lower freshman enrollment at New Brunswick and will increase at the other two campuses to compensate. There are 50 residence halls (including apartments) but more will be added with the $1 billion dollar expansion that the university is undertaking, which will include new dorms (including honors), academic buildings, new nursing facilities, and other programs. One of the coolest things I learned during the information session was that Rutgers was instrumental in developing the first underwater self-propelled tube across the Atlantic from NJ to Spain. The tube was controlled form Rutgers, and the ship that accompanied it (called Scarlett because of Rutger’s colors) was manned by students and staff from the university. There were even freshman on the team, including English majors who accompanied a Professor who was a documentarian; some were so excited they switched to oceanography as a major! Rutgers ranks as 21st in the nation in sponsored research. They have the largest indoor practice football “bubble” in the country, and the Giants and the Jets practice there. Their intramural sports include a 5’5” and under basketball league, quidditch, and underwater basketweaving. Their swimming pool has a hydraulic floor to control its depths. Their Physics building looks like a cupcake with a steep underground lecture hall. There are over a hundred study abroad experiences in 40 countries. 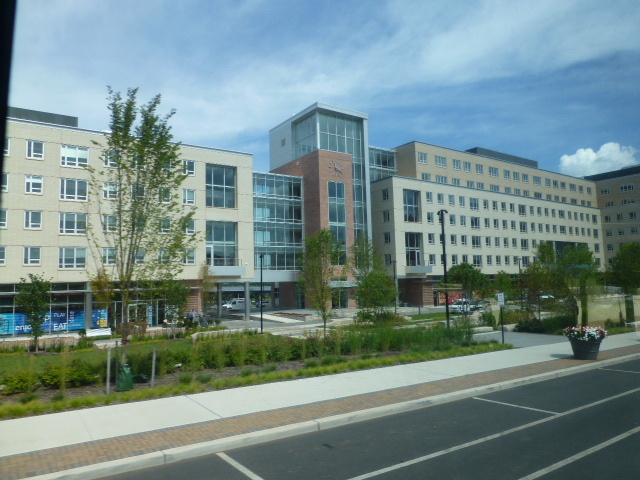 Some of the off-campus housing is closer to the bus-stops on campus than several of the dorms. 3 different police patrols cover campus. Nabisco funded their Food Science Building. They have a well-renowned Marine and Coastal Sciences program. Supply Chain Management and Business Analytics Information Tech are the newest majors from over 100 to choose from. Departments are organized into schools: First year students can apply to Nursing, Pharmacy, Arts, Business, Arts & Sciences (the largest division), Engineering, or Environmental and Biological sciences. Nursing is a direct admit program, but it’s not required that they start the first year. Many students start in Arts & Sciences, take the first-year classes, and do a school-to-school transfer. Engineering students take their intro classes in A&S and then begin the Engineering program. First year engineering students have a special residential hall; students who live there have a .5 higher GPA than those who don’t. There’s a “We’re in this together” attitude. The students are told, “Look to the left; look to the right. It’s YOUR responsibility to make sure you’re all here next year.” Materials Engineering: They are working on making bridges out of used milk containers! The Arts school is a conservatory and will earn a BFA except for the music majors who have the choice of getting a BA through A&S. The theater students study abroad at the Globe Theater. Pharmacy is a 0-6 degree; they enter right out of high school and will get a DPharm (required to be a practicing pharmacist) in 6 years. This is highly competitive with 3800 applicants for 220 spots. In Business, juniors and seniors can apply to major in Planning and Public Policy, Management and Labor relations, or Communication and Info if they’d like. Rutgers has Priority application dates, but not Early Action or Decision. December 1 is a priority deadline and is the last date that applicants will be considered for scholarships. Some of the more competitive schools will also be closed after that. After 12/1, the online application will only show what programs are still open. Students apply to up to 3 schools: students can rank their top three options (and actually could get accepted to all three). Students have to self-report their own grades; they only turn in a transcript after they deposit (the final end-of-year transcript with the graduation date is the best). They only had to rescind 2 acceptances last year because students misrepresented their grades. They will superscore both SAT and ACT. No TOEFL is needed if the international student graduates from an English-speaking school, but it can help if the CR section is low. Currently 14% of the school is from out-of-state; they’d like to get that up to 25% (which is still under the other Big Ten schools). One of Rowan’s claims to fame is that it hosted a meeting in 1967 between President Johnson and Soviet Premier Kosygin at the Hollybush Mansion, the university president’s home. They met here because of its location halfway between the UN and DC. Apparently, Lady Bird Johnson took the chairs which are now in the Smithsonian with a tag that says “Donated by Rowan” – the tour guide says that if we go there, we should tell people that they were taken from Rowan, not donated! I had no idea what to expect from Rowan, one of New Jersey’s public universities, but I walked away with a good impression. Students are happy and enthusiastic about the programs and the opportunities they’ve had. This school of 10,750 undergraduates has recently been designated as a state Research Institution, and they’re proud that they do not do research at the expense of the undergraduate. Instead, they’ve been doing a great deal to expand their offerings and opportunities for their students. More money has been going into resources for students, and more scholarship money is available than ever before. They’ve increased their academic offerings for students, including eight new PhD programs and several new Masters programs are in the pipeline. Their Med School is highly competitive, receiving 3,000 apps for 50 seats, and it’s only the second university (after Michigan State) to offer both an MD and a DO (osteopathic medicine) degree. This has had a “trickle-down effect” into their undergraduate programs, and every undergraduate college on campus has a pre-med program, even the performing arts, including using dance as part of therapy. They’re getting away from the traditional model of pre-med prep. They are proud of their Four Pillars program which includes: Economic Engine (helping students getting job and becoming involved in the community); Affordability (they froze tuition by keeping efficiencies in the system); Accessibility (making education available even though they’re getting more selective); and Growth (they’ve built the Stratford Campus for the medical and graduate programs, and they’ve built a partnership with Rutgers for a biomedical school). They’re looking to DOUBLE their student population over the next 10 years. They’ve already shown tremendous growth in their numbers; they used to only serve students from 4 or 5 counties; now they’re a well-known regional university, and they want to become better known across the country. Their out-of-state applications have been rapidly increasing, almost doubling last year from 400 to 700. In the most current freshman class, students had an average of a 3.6 GPA and 1200 SAT or 26 ACT. Some of the students’ favorite classes have been the History of WWII, the Arab-Israeli Conflict, and Developmental Psychopathology. Their classes range from 10-35, and they appreciate the small classes and the chance that they know the professors; people notice if they aren’t in class, and they’re able to get a lot out of classes. Rowan has a strong business program, including Supply Chain and Logistical Systems, Management Info Systems, Entrepreneurship, and other more usual concentrations. Engineering students can choose to specialize in Chemical (ranked 3rd in nation, top among public universities), Civil and Environmental, Electrical and Computer, or Mechanical (ranked 8th in nation). Within the Humanities and Social Sciences College, their Africana Studies, Law and Justice Studies, and Planning are the most unusual majors. In the Science and math division, students can choose from all the usual majors, plus Bioinformatics and Child Behavioral Services. Education is strong at Rowan, and they have a program that allows students to graduate before student teaching, as long as they’ve fulfilled all the other requirements. Two of the tour guides had just graduated but were staying for one more semester to do their student teaching requirement. Although there’s a lot to do on campus, students love that they’re only 20 minutes from Philly, 45 minutes to the shore, and halfway between NYC and DC. The school is doing a lot to do more outreach into the local community, and the activities on campus give students a real sense of community within campus and into the wider town. Unless students commute from a parent’s house, they have to live on campus for the first 2 years. There are freshman-only dorms which are mostly traditional style, but some have suites where they have to clean their own bathrooms. The university is building a 5-block-long apartment complex with Honors housing, B&N bookstore, Starbucks, retail shops and restaurants, arts and entertainment district. Ten percent of the student population joins Greek life.